OBJECTIVES: Single port access surgery is an emerging technique in laparoscopic surgery. Currently outcome data is limited for a majority of procedures. 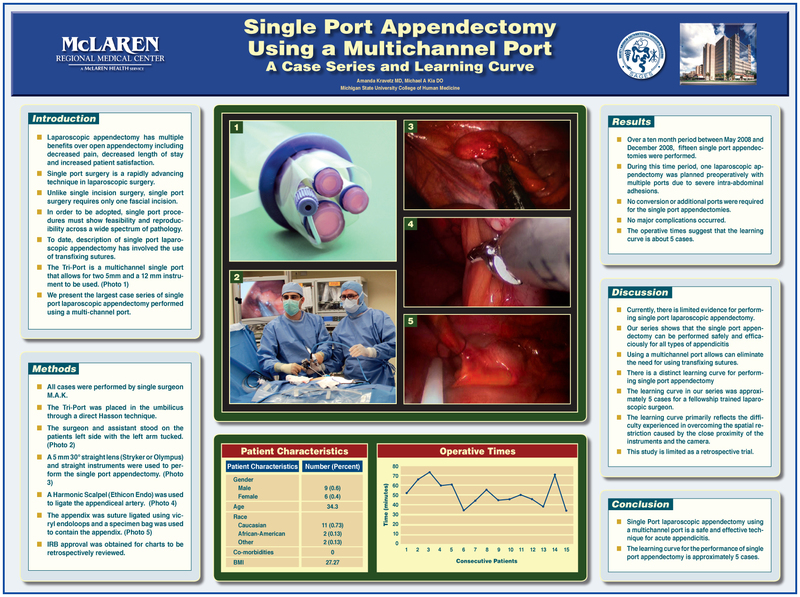 We present the largest series of single port appendectomy performed for acute appendicitis. METHODS: Over a 5 month period, ten consecutive patients presenting with appendicitis underwent single-port appendectomy using the Tri-Port multiport (Advanced Surgical). The procedures were all performed through the umbilicus. Retrospectively, patient characteristics and operative outcomes were evaluated. RESULTS: The average age of our patients was 34 and the majority of patients were male (6/10). Average BMI of our patients was 29.4. The mean total operative time time was 68 minutes with an incision size of 1.5 cm in the umbilicus. No postoperative complications occured. No additional trocars or conversions to open were required. CONCLUSIONS: Preliminary measures of the outcomes of single port appendectomy reflect that this is an effective and feasible laparoscopic approach. In addition to the obvious cosmetic benefit, patients may benefit from decreased pain and hernia rates.